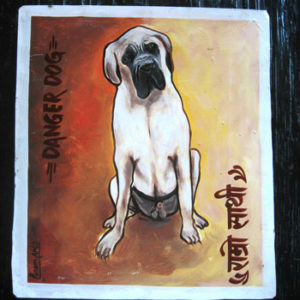 Mastiffs are massively beautiful when painted by a Nepali signboard artist. 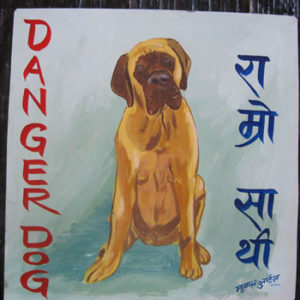 Folk art portraits of a Mastiff hand painted on metal by a signboard artist in Nepal. 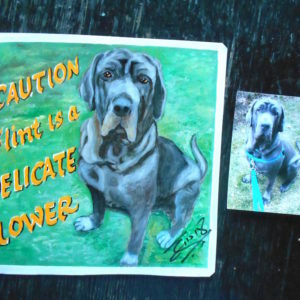 Max the Mastiff is lovely as hand painted on metal by Jit Gurung, a signboard artist from Pokhara, Nepal. 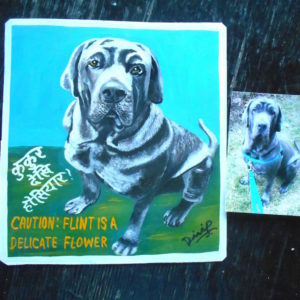 This hand painted portrait of a Mastiff named Max is by Rajesh of Punam Arts in Pokhara. Though instructed not to include Max’s privates (rather prominent in the photo provided) Rajesh chose to include Max in his full glory, and even added what appears to be see-through underwear.